*Repressed and available on vinyl for the first time in many years...* "Brought up in Manchester’s Moss Side, Barry Adamson began his career in 1977, learning to play the bass literally overnight for Magazine, Manchester’s most influential band of that era. When they disbanded five albums later in 1981 his definitive touch was spotted by The Birthday Party, with whom he played several times. After that band’s final implosion in 1983, Barry became a founder member of The Bad Seeds, along with Nick Cave, Mick Harvey and Blixa Bargeld. 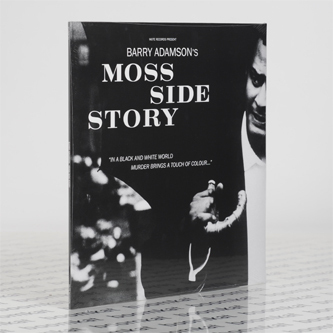 Nurturing a vision of The Great Soundtrack, Barry returned to Manchester’s mean streets in 1989 to compose the autobiographical thriller ‘Moss Side Story’ - the themes for a film that never existed. Uncovering Adamson influences, from John Barry to Ennio Morricone to Lalo Schifrin, the album set a precedent for inventive forms and thinking through echoes of cinema past and features guest appearances by Diamanda Galas and Rowland S. Howard..."